In August, Animal Recovery Mission investigators went undercover to document an unimaginably barbaric animal sacrifice event. This festival known to the community as Deopokhari or Khokana Festival, has been established an age old tradition for 900 years, and occurs annually in the small town of Khokana located just eight miles outside of Kathmandu, Nepal. 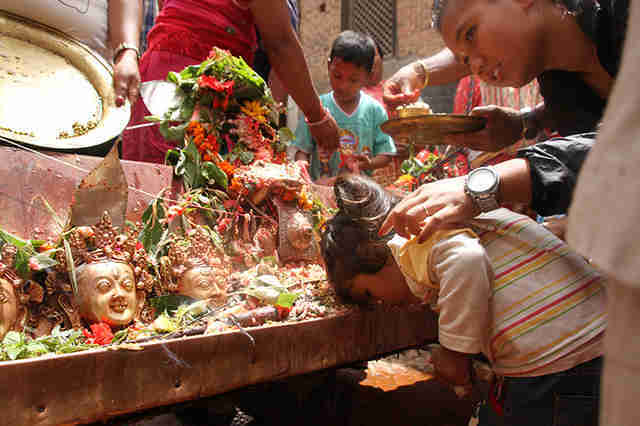 This savage ritual, takes place every August on the day after Gai Jatra, where people of Nepal celebrate over a two day period in preparation of the final day, in which an innocent 6 to 8 month old female goat is subjected to prolonged torture - eventually ending after a long drawn out death, often lasting over 40 minutes. All in efforts to honor the goddess of the pond situated near the Rudrayani temple. The Hindu sacrificial ceremony of Deopokhari, stemmed from a legend involving gods from medieval times who would drown children in the town pond. 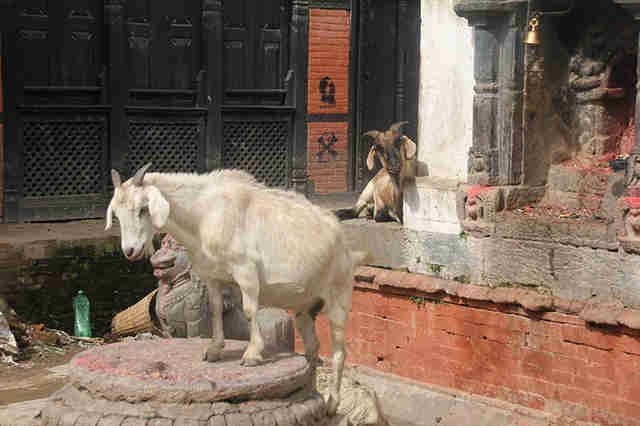 Advocates of this Hindu sacrificial "tradition" believe that the gesture of sacrificing a young goat will appease the goddess, Throughout the days of the Khokana festival, the animals involved in these rituals eventually succumb to their untimely deaths after experiencing violent agony during the preparation and throughout duration of their deaths. 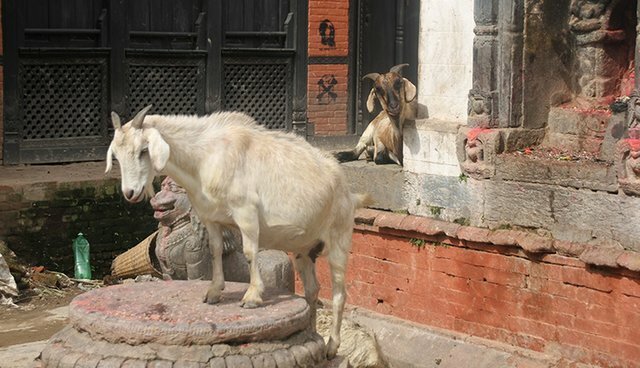 Goats who haven't even had the opportunity to live out their lives, are taken around 6 to 8 months old, brought to a pond close by the Rudrayani Temple, and while trembling with fear, thrown into the pond while a group of nine young men compete to tear the goats limbs apart, carrying out its death for over 40 minutes, until the goat eventually faints from pain or is brutally ripped apart. The "hero" or winner is rewarded by leading the celebratory Shinkali dance which follows the blood curdling, satanic aftermath. 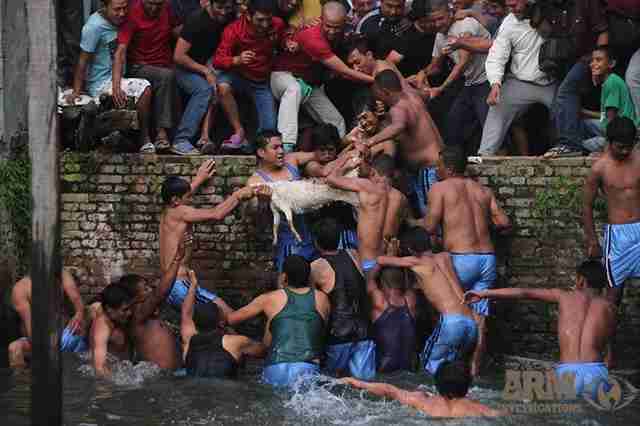 Besides being drowned and mutilated to death, outside of the pond, other rituals take place amongst festival goers who sacrifice goats and fowl by slowly severing their heads off with extremely dull blades while the animal is still alive. The animals death is executed for over a minute, restraining best they can while feeling every ounce of excruciating pain as their heads are slowly detached from their bodies. What makes these events even worse, if thats even possible, is that the animals death are purposely dragged out as it is believed that slow deaths are more appealing to the goddess. This festival, is just one of the many Nepali animal sacrifices leaves countless of defenseless animals tortured, and suffering to their deaths. 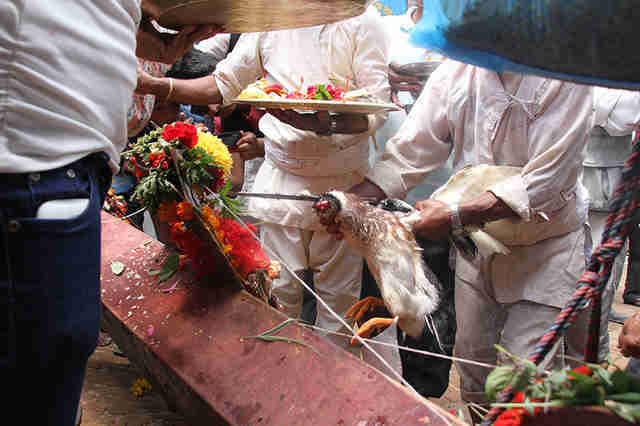 The Animal Recovery Mission will continue it's investigations in this country and is working with the Government, congress and people of Nepal to refrain from sacrificing animals during their traditions and ceremonies. WARNING: This video is graphic in content. How can people of Nepal, who choose to follow these ancient traditions of sacrificing animals, evolve their customs by using alternative offerings without the proper education and knowledge of just how much pain and suffering they are causing to the animals? The government needs to realize what horror is done in their country and that they have the capabilities to dramatically impact and save the lives of countless animals sacrificed in Nepal during the annually occurring festivals such as the Khokana festival. To help in ARM's fight against this festival, please sign the petition. Visit ARM's website to learn more about this festival as well as the others which ARM investigate.